Understanding the needs of Plastics & Rubber processing industry and developing fully indigenous solution to cater to these needs has always been the prime target of Zenith. When the need was felt for a mixer capable of hard mixing from process compounding view point, Zenith developed Dispersion Mixer. It can be employed in a wide range of material mixing, ranging from low viscosity adhesives to high viscosity rubber. Zenith Internal Mixing series is a highly developed range of Dispersion Kneaders for rubber and other polymers with high productivity and consistently good mixing with minimum electricity consumption. Model Main Motor H.P. Total Capacity Working Capacity Ltrs. Rotor R.P.M Tilt Method Tilt Angle Tilt Motor H.P. Air Comp- ressor H.P. Wt. App. MORE OUTPUT Kneader output is four times more than mixing mill. ROTOR BLADES The blades are made for special purpose alloy steel material. and edges are made with special extra hard material and hard chromed for durability and to avoid rust formation as the come in contact at the time of mixing. CHAMBER The chamber is specially designed and made by alloy steel casting to withstand maximum strength for better dispersion. EASY DISCHARGE Chamber is mounted on tilting arrangement which can be tilled to 120 Degrees to gives easy and max discharge of rubber compound. THERMO COUPLE Thermocouple is fitted to the mixing chamber to measure Temp. Accurately. COMMON BED The machine has common bed on to which the mixer speed reducer and motor are compactly arranged. LUBRICATION Auto lubrication system is provided for bushes and bearings, which gives more life and better working of machine. COOLING & HEATING The mixing chamber is jacketed for cooling. AIR CYLINDER The Air cylinders are operated through valve fitted in the operating panel. POWER A/C 415 volt 50 HZ 3 Phase. Can be supplied with optional power supply on customer demand. 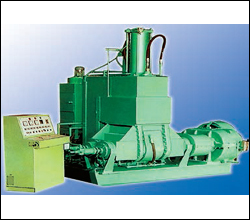 The machines are supplied with all Standard, Equipments like Motor Compressor or Collector Panel.